India have had very much the worse of conditions in this match and they have also been facing some masterful swing bowling. All the same, it’s hard to avoid the conclusion that they haven’t really made any runs. Out of interest, we checked which batsmen had played in the Test matches the last time they toured so that we could judge who had failed to come up with a method for dealing with difficult conditions. You may or may not (want to) remember that India were bowled out for not-very-much several times when they toured England in 2014. A couple of guys made hundreds, but this seemed to coincide with all the other specialist batsmen making nothing. Other times everyone made 30 or 40 but not much more. By the end of the tour, they were very much batting like they are now with the captain (MS Dhoni back then) playing a lone face-saving hand as the world collapsed around him. The batting line-up for the first three Tests was Murali Vijay, Shikhar Dhawan, Cheteshwar Pujara, Virat Kohli and Ajinkya Rahane. The one thing you could say is that they didn’t get a huge volume of experience of batting in difficult conditions for the simple reason that they kept getting dismissed. They’ve very much picked up where they left off. Which is less than ideal when totals were getting smaller and smaller. Not many Tests are wrapped up in 170-and-a-bit overs these days, even Afghanistan’s debut Test took slightly longer to reach a conclusion I think. I’m surprised there was an expectation that they would make runs. They didn’t make any runs when they played SA either, and conditions in England are worse (from their perspective) and bowling is better. 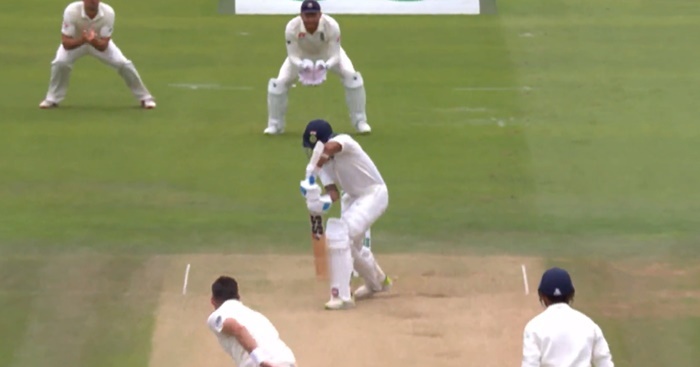 Was the whole “India should win the test series” narrative a masterful plan to heap pressure on a team which is already poor at travelling or just a lot of negativity around the English test team? England have lost home Test matches to teams who are, on the face of it, inferior to India. It wasn’t an illogical conclusion. Their top six is hardly piling on the runs even now. A bit less swing will make for a very interesting match. It’s fair to say that this was both figuratively and literally a perfect storm. India could have made an effort to be less pathetic, but England are pretty much always going to win a game like that. I thought India would win the series. Edgbaston could sort of be a watered down version of their Adelaide (sorry for bringing it up). They really should have won that game, and if they had then it’s not impossible England would have imploded. As it is, it feels like 4-1 is probably the height of their ambition. Rashid had a Test reminiscent of many of the games I played. Didn’t bat, didn’t bowl, no catches. Picked controversially, given no chance to impress, thus failed to impress. He’s going to get dropped for the next test isn’t he as England pick five seamers and then finally find a pitch that doesn’t swing. In hindsight, Rashid has had the best preparation for this test match. All the naysayers, & those who derided his manner of selection, esp the Yorkshire-wallahs must eat the humble pie now. And Anders son, mighty as the warriors of old, brang forth the orb, blood-red, beloved weapon of Odin, and sent it forth with swing-fire. And the orb feasted on the wickets of the invaders. It smote the legs even as they stood in front of the gate, it drank of the willow-spirit as it nicked one to slip, and it dislodged the all-powerful bail. At great Odin’s command, channelled through his glorious warriors, the blood-orb swung this way and then that. None could understand its path, which exceeded the ken of all but Odin himself. In this way was England made victorious, by an innings, and the Englishmen drank of the victory-mead, even as they surveyed the wreck of India’s fiercest sons. Ai so the chieftain Root, son of Root, son also of Root, claimed the field on this day, a red day, a rain day, damp, dark, under swing-clouds, black on green, and he was beloved of the members in the pavilion. This match report is excellent, or rather, blood-roasting. Has long & oft been thus, KC, viz Indian batting collapses at Lord’s. I haven’t yet prepared my match report for yesterday’s match, but here’s one re my vicarious witnessing of the 1974 Lord’s test, which I Ogblogged yesterday evening. Strangely, I had even added some iconography that, coincidentally, goes rather nicely with Bert’s delicious Norse match report. There’s 3 tests to go yet. Can still draw or even win this thing! They won’t of course, but not mathematically impossible yet. Actually this a awesome post. Due to the collapse of the Indian Batting order, the team is suffering. Swing conditions has always been a headache for the Indian Team.